Playstation 3 owners: Fiddle with that programmable monster remote no longer. 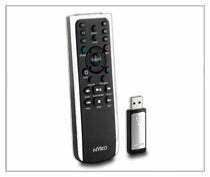 Nyko is here to save you the hassle with the Blu-Wave IR remote control, a simple USB/remote solution that will let you control DVD playback in a more traditional way rather than with the Sixaxis, Sony's official Playstation 3 controller. The buttons on the remote mimic the same functionality the Sixaxis provides, and communicates via infrared to the USB adapter which plugs into any port and doesn't require additional setup. The best part of it all? The Blu-Wave is only $20. As a DualShock veteran of DVD playback on the Playstation 2, controlling the menus with a Sixaxis isn't a big deal for me. However, this remote is perfect for people who have made attempts at Bluetooth workarounds to try to get the Playstation 3 to recognize a programmable remote and find it too much trouble. Just plug the adapter into any USB port on the Playstation 3, put two AAA batteries in the remote, and keep within 25 feet.